These are manufactured from virgin Ultra High Molecular Weight Poly Ethylene (UHME-PE) powder, white in colour. These wheels are light in weight but have very high load carrying capacity, higher wear resistance as well as high impact strength. Therefore the question of wheel cracking under load or impact load does not arise, as it happens in case of nylon or fiber wheels. The material has got very low coefficient of friction. Therefore, pulling or pushing force required is considerably less. The material does not have any effect of chemicals or acids. 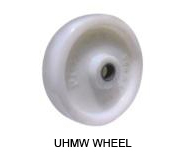 Though the UHMW wheels can carry heavy loads, the material is not hard like cast iron. 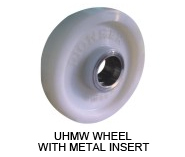 Therefore UHMW wheels do not damage the flooring. Polyurethane with high abrasion resistance bonded (molded) over a cast iron core forms a PU-CI Wheel. 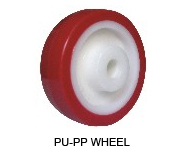 The load carrying capacity as well as life of wheel is much more than that of PU-PP wheel. PU-CI wheels have good shock absorption capacity & very low noise level. PU-CI wheel can be made in other sizes also, on request from customer. The wheel consists of Solid Rubber Tyre clamped between two presses steel drums with nuts & bolts. Tyre is made from good quality rubber compound to ensure long life & good cushioning effect. The tyre, when worn out, can be replaced easily on sight. In case of SRT Wheel 100 x 32 & 125 x 32, width of boss of wheel is 38 mm for LD & LD-X series wheels & 45 mm for MD series wheels. SRT wheel of NRB type are provided with plastic cage NRB. Metal cage NRB can be fitted in these wheels on request. 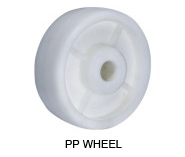 These wheels are manufactured from virgin Polypropylene Co-Polymer (PP-CP), white in colour, by injection molding. The wheels are light in weight but have fair load carrying capacity. The acidic or alkaline chemicals have no effect on these wheels. In case of PP Wheel 100 x 32 & 125 x 32, width of boss of wheel is 38 mm for LD & LD-X series wheels & 45 mm for MD series wheels. Polyurethane with high abrasion resistance, mechanically locked over a polypropylene core, forms a Polyurethane wheel. 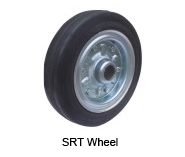 The load carrying capacity as well as life of wheel is much more than that of SRT wheel. 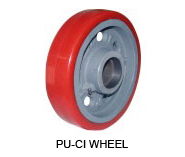 PU-CI wheels have good shock absorption capacity & very low noise level. In case of PU-PP Wheel 100 x 32 & 125 x 32, width of boss of wheel is 38 mm for LD & LD-X series wheels & 45 mm for MD series wheels. 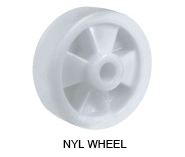 These wheels are manufactured from virgin Nylon 6, white in colour, by injection molding. These wheels are light in weight, but have high load carrying capacities. These wheels can be used up to 90°C temperature. The acidic or alkaline chemicals have no effect on these wheels.